I woke up this morning and thought that I would check out the progress of Incline Softwares release of Ancestral Quest 12.1 and Ohana Software Family Insight. 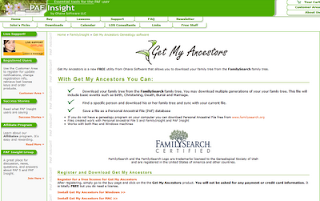 To my surprise, Ohana has released the new program Get My Ancestors for New FamilySearch. Get My Ancestors is a utility program that accesses New FamilySearch allowing for you to download members of your family tree into a PAF 5 format. The utility allows you to download your ancestors or progenitors utilizing the Personal Identifier number. I tried it out to see how it works and it is efficient in extracting the data from the enormous FamilySearch database. To test how fast the program worked, I tried to download 15 generations of ancestors on both sides of my family and found that the download time varies depending upon the amount of information available. One side of the family downloading 15 generations took approximately 20 - 30 minutes for 1500 individuals; the other side took 1 hour and 13 minutes for 5083 individuals. I would caution that if you choose to utilize this utility that you download only a few generations at a time. On a side note, I would suggest taking the information that you download, confirm it the information is accurate prior to adding to your family file at home. On the other hand, if this is the first time you have ventured into family history/genealogy work, the information that you find on New FamilySearch can provide you a great starting point for your family records, finding and confirming the information along your journey. The utility program can be used on a MAC or PC, but at this time it only interfaces with the PAF program. I confirmed with Ohana regarding the MAC compatability and was told that the program only generates a PAF file resulting in those MAC owners having to either run the first version of PAF for MAC or to utilize a PC emulator program to run PAF in the Windows environment. To learn more about Get MyAncestors click Ohana Software. GetMyAncestors saves a PAF 5 file. The old version of PAF that runs on the Mac will not open PAF 5 files. Using GetMyAncestors on the Mac gives you a file that can be opened by FamilyInsight or by PAF 5 run through an emulator. I tried it, but it failed to install. Do you need PAF Insight? You do not need PAF Insight to run the GetMyAncestors program. I would download the file again and then try a install. If it continues to fail, I would contact Ohana Software for support. They are great in helping you with getting the program up and running. Good Luck!